What follows in this section is an admittedly long – but much needed – set of team-by-team disclaimers and explanations for the selection of each radio flagship used throughout this overview. When the choice is between a music-intensive FM and a spoken-word station, the latter – which theoretically devotes more time to the team during the week – gets the nod. The top line consists of the team and its flagship noted here. If applicable, any additional information appears on the next line(s). Teams are noted in descending order of PPM-market size. In conflict situations, co-owned all-news WCBS-AM is the backup. 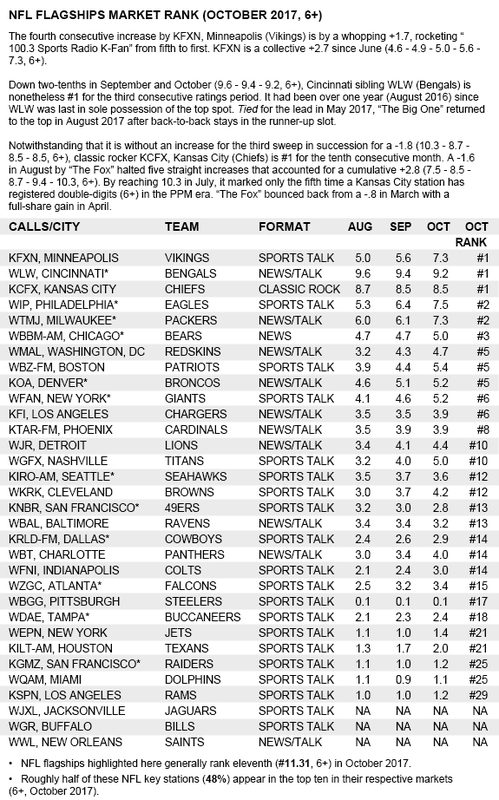 The team returns to Los Angeles from San Diego; other flagships are co-owned sports talk KLAC and San Diego sports talk KLSD. Entercom classic rock KSWD is the FM flagship, but it’s about to become contemporary Christian under new owner EMF. This franchise returns to Los Angeles from St. Louis. Backup is co-owned classic rock KUFX. Co-owned classic rock KSAN is the FM flagship. 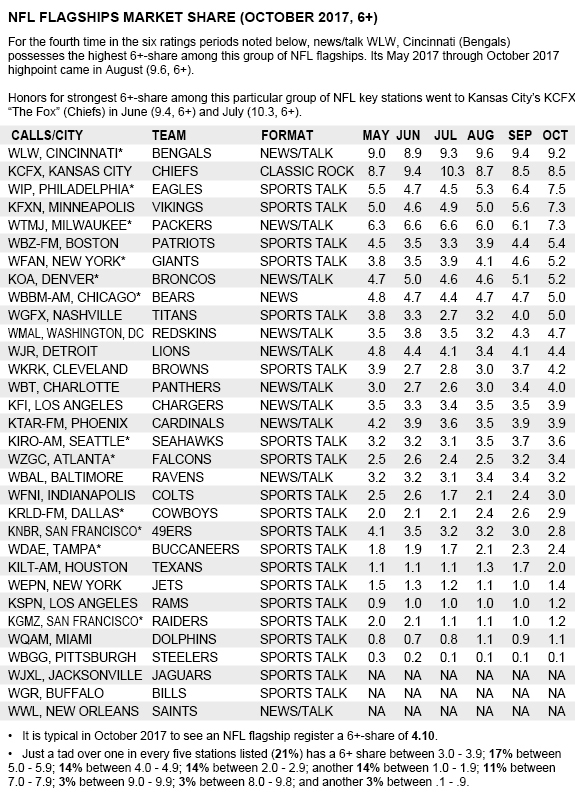 The AM flagship is co-owned news-talk KRLD-AM. Co-owned country KILT-FM is the FM flagship. 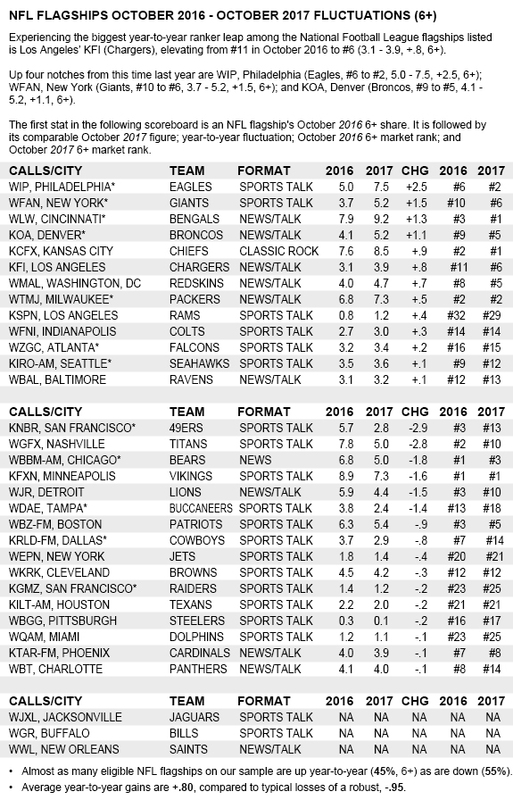 Red Zebra sports talk WTEM is unlisted in Nielsen Audio’s October 2017 sweep. Co-owned country WKIS is the FM flagship. The FM flagship is co-owned news/talk KIRO-FM. Co-owned classic rock KRFX is the FM flagship. The FM flagship is co-owned rock WXTB. Co-owned rock WIYY is the FM flagship. The FM flagship is co-owned classic rock WDVE. Co-owned rock WEBN is the FM flagship; also, co-owned sports talk WCKY. 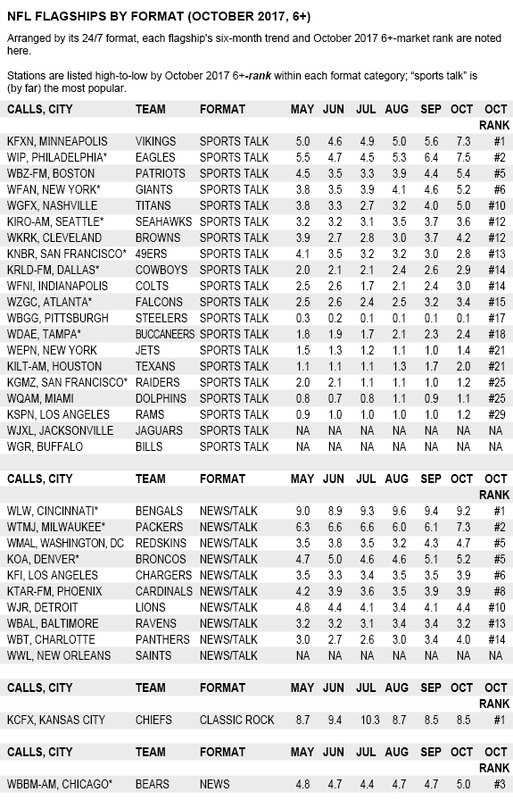 Another FM flagship is co-owned classic rock WNCX, while Good Karma sports talk WKNR-AM does not appear in Nielsen Audio’s October 2017 sweep. Co-owned country WLHK is the FM flagship. 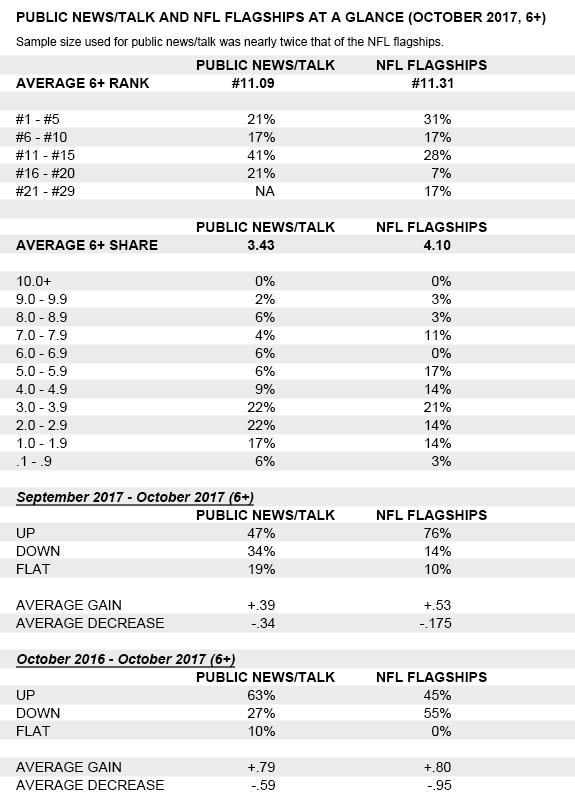 Jacksonville Jaguars: Seven Bridges sports talk WJXL is unlisted in Nielsen Audio’s October 2017 sweep. 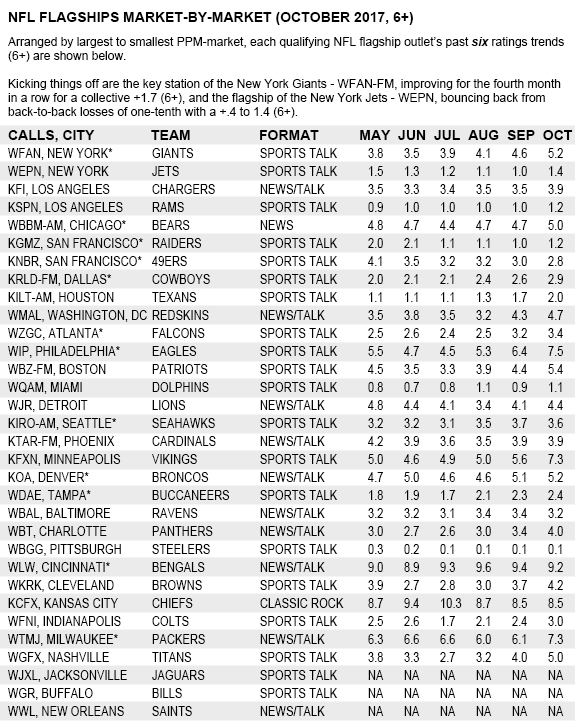 Some NFL flagships are MLB key stations as well; those stations are designated by an asterisk (*). Coming up tomorrow: A look at alternative/modern rock-formatted stations; email managing editor Mike Kinosian at Kinosian@TALKERS.com.